Businesses around the world are paying more and more attention to Yelp, arguably the Internet’s largest social-local platform, and with good reason. Touting it’s average 135 million monthly users, dominance in local search engine results, and ability to shut down businesses over night, Yelp is force to be reckoned with. While I have more than enough evidence of the positive effect of Yelp on foot traffic and sales for the accounts I’ve managed over the years, there’s a dark side to Yelp we struggle with requiring hundreds of thousands of dollars toward online reputation efforts, which may balance out the revenue value from advertising with Yelp. The controversy that has yet to come to any resolve after multiple lawsuits and negative PR, are the influence of Yelp reviews, the bias of negative to positive sentiment in the filtering of reviews, and the overall impact reviews have to a local business (knowing that most online traffic now comes from what users find in a Google search result). Yelp doesn’t want you to think about that, they want you to focus on the foot traffic and dollars, but they might be ignorant to let negative reviews build up based on the influence they have. For businesses new to Yelp, a sales rep is more likely to sell the concept that “finding local businesses” is the primary reason users patronage the online giant, which for those of us whole fully understand it’s power, is frustrating and feels misleading. What is the primary reason you use Yelp? 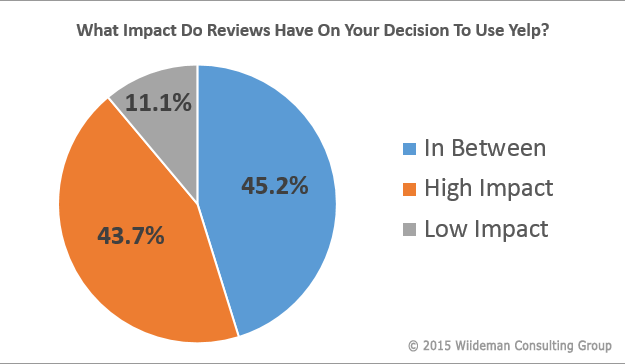 What impact do reviews have on Yelp visits? 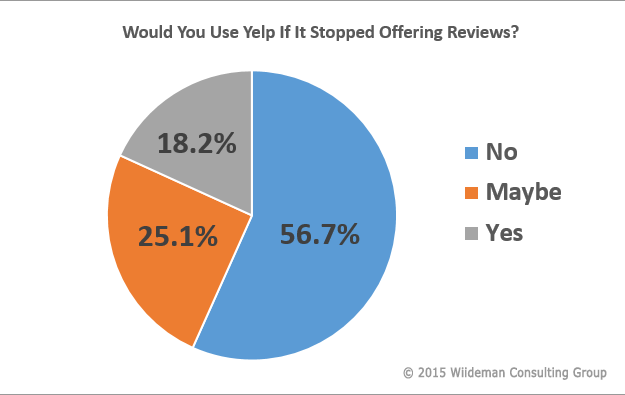 Would you still use Yelp if it stopped offering reviews? I believe our users are coming to Yelp to find local businesses because they can trust the overall content they find on our site. Yelp aims to provide the most helpful information available. While not the only reason our users visit Yelp, reviews do give credibility to the business, and the volume of reviews is a trust signal for users. Zach makes a great case for reviews playing a major role in the attraction users have toward Yelp. By the way, thanks for taking the time to chat with us Zach, if you’re reading this. There are many reasons to be a fan of Yelp. Our disagreement had to do with the primary reason people use or visit Yelp, and was validated with an overwhelming 60% of respondents claiming they primarily care about business reviews over finding business near them, researching business details (hours, directions, etc), socializing or for some other reason. Now that I feel validated, I could stop writing now, post a meme on Twitter with a kid shaking a fist, tag @Yelp and go home with my know it all personality in check; but how fun with that be for everyone else? Let’s dive a little deeper and share some of the other data I was able to find and analyze. Starting with gender, it turns out that women actually care more about reviews then men, 5.5% more in fact. 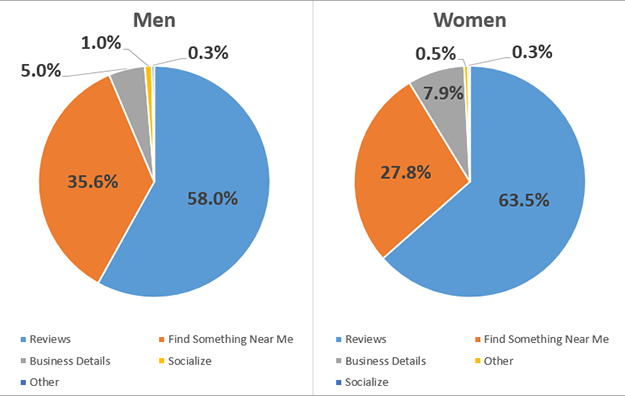 Reviews are still the primary reason both men and women use Yelp, but as you can see from the chart below, men are looking for businesses near them nearly 8% more than women, and women possibly look deeper at business data 3% more than men. Here’s a shocker, men may be more social on Yelp than women (1% of men use Yelp to connect with other Yelpers, where only .3% of women say they primarily use the platform to engage with others). How might a business owner benefit from the male vs female comparison above? For starters, businesses with a predominantly male demographic might focus more energy on being found in Yelp search results, learning about barnacle SEO, and connecting directly with male users in their area to build friendships that might later prevent a negative review. For businesses targeting mostly women, perhaps giving more emphasis to “check us out on Yelp” on receipts and promotional material, and focusing on the details within the Yelp profile less about ranking criteria. Since we’ve already established that the primary reason people use Yelp is reviews (okay, I’ll stop rubbing it in), I think it’s important to point out the impact reviews have on a person’s decision to use Yelp altogether. 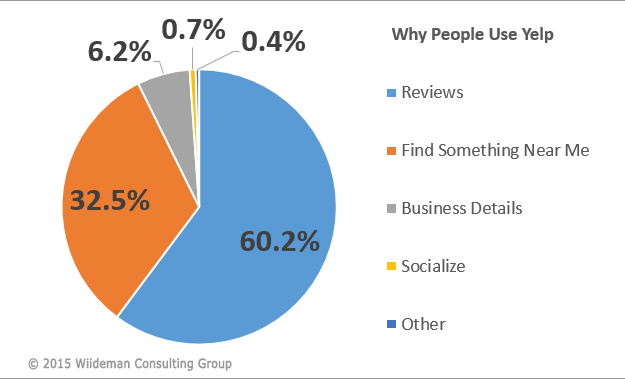 Surprisingly, 45% of respondents couldn’t decide if reviews were that important to them. However, an overwhelming 43.7% said reviews are a major reason they visit or use the app, where 11.1% could care less about reviews. How is this data useful? Maybe Yelp’s strife with businesses on promoting reviews should be reevaluated. Yelp holds an interesting viewpoint on online reputation. They told Mashable their reason for penalizing businesses asking for reviews has to do with equality and consumer reasons for using the platform. Basically, they are saying “consumers don’t use the platform primarily to leave reviews”, which we just debunked above. We don’t believe that consumers necessarily want to be seen as a promotional vehicle. Sorry Yelp, consumers are and always have been the promotional vehicle to successful businesses, you might want to rethink things. 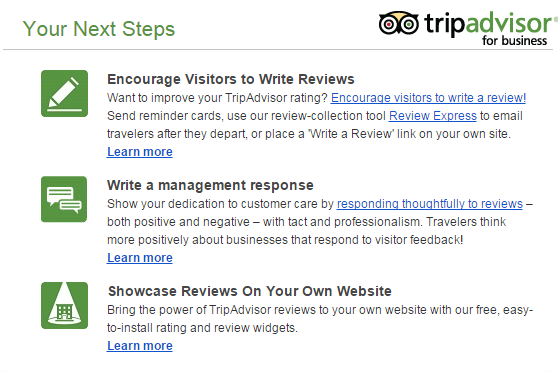 TripAdvisor has been listening and paying very close attention to what businesses who feel imprisoned by Yelp are saying, and have crafted a brilliant campaign to help businesses promote reviews on TripAdvisor. Seems to me that Yelp might be falling behind the curve, to the point where telling business what they can and can’t do to ask happy customers to share may eventually become audacious and the first mistake toward the end of an important era. Just because you have a great SEO Team, doesn’t mean you’ll always have the greatest user loyalty, especially as more individuals become entrepreneurs and look to their customers to help them get the word out. Keep in mind that at no point did I ever once suggest that Yelp should remove negative reviews. It’s the responsibility of the business to provide a great product and superior customer service. Having better control over real reviews vs malicious activity I’ll save for another post. Would You Still Use Yelp Without Reviews? Now the big question: would Yelp users continue to patronage them if reviews were no longer offered as part of the service? We know reviews are the most important attribute to users. We also know that reviews have a high impact on a user’s decision to use Yelp. But would users stop coming to Yelp if reviews didn’t exist? The answer: 56.7% of users would not continue to use Yelp if reviews were removed, and 25.1% might not use Yelp. Only 18.2% are loyal enough to Yelp that they’d continue to visit the website or use the mobile app without reviews. Going beyond the whining about Yelp reviews, it’s important to realize as marketers that there are predominantly two domains that appear for local searches (most of the time above your listing thanks to Google Pigeon): yelp.com and yellowpages.com. You either optimize your placement in those two destinations or go back to pay-per-click advertising. 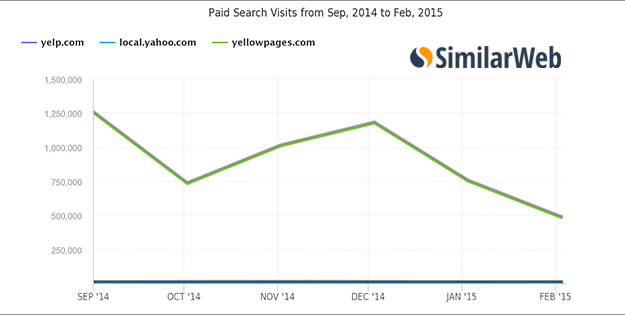 Thanks to our friends at SimilarWeb, I was able to pull some interesting industry insights about Yelp in early 2015. For starters, compared to Yellowpages and Yahoo! 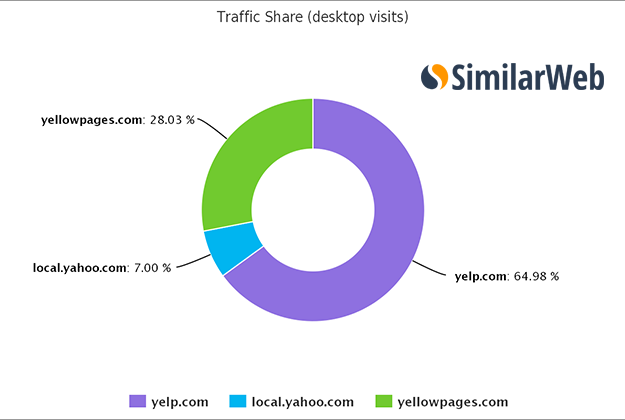 Local, Yelp may own 65% overall traffic share, confirming they are indeed the 800 lb gorilla in the local search space. You’ll also notice that Yelp receives significantly more Direct visits, which means fewer people are going directly to Yellowpages.com, such as my mother and your grandparents, so don’t count on that number going up anytime soon. Should Yelp Carry an Umbrella? 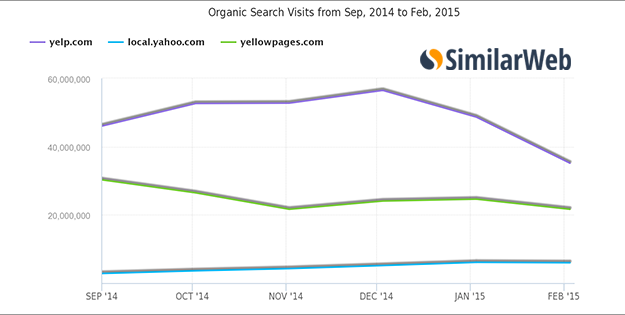 Since organic search is the number one source of traffic for Yelp (despite what they want you to believe about app usage), overall traffic to Yelp appears to be dying from what we can tell. Not good Yelp, not good. Any search engine optimization specialist working with multi-location or franchise SEO understands the power of Yelp. 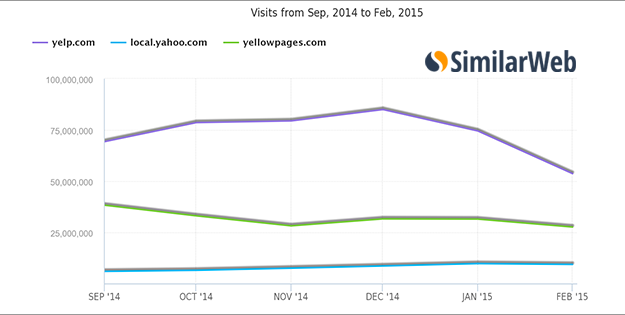 Though it still accounts for less than 1% of all traffic for larger brands, Yelp traffic converts. No store ID’s or unique identifiers – even aggregation and syndication services offer a unique ID. One marketer told us he found 11 locations running that were closed months earlier and 28 location never launched, which could have been flagged if his store IDs were allowed. Yelp can only “launch” advertising programs (i.e. 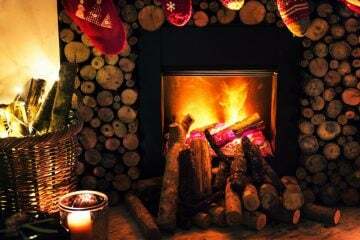 : new locations) on the 1st and 15th of the month, but never in real time. Yelp may have the most archaic, fragmented advertiser management system of all the paid advertising platforms online today. The best explanation I have for Yelp is that CEO Jeremy Stoppelman is spending all their money on sales teams, legal fees and customer service teams to keep their review “filter” running “properly”, and legally vs. investing in upgrading their tech, to continue evolving like the rest of the local-social platforms out there. It seems if they could streamline the new location launching process (for multi location businesses) and get locations up and running in their advertising program the next day vs. waiting until the 1st or 15th, they could make more money. Something just doesn’t add up to me.. And knowing Yelp, they’re doing it for a reason. On the topic of reviews, if reviews aren’t the most important aspect of Yelp, why would their previous tagline be “Real People. Real Reviews.”? As a semi-frequent user of Yelp myself (follow me here), I enjoy the community, leaving and reading reviews, and uploading photos, but more to remind myself of what I did the last time I visited a business, not as much to share with others. As a marketer, I’m constantly called upon to provide solutions and strategies for online reputation that often involve Yelp. A real problem exists, and I’m disheartened by Yelp’s lack of compassion and blatant downplay of the impact their review system has on local businesses. A quick solution would be for Yelp to acknowledge that consumers are the main promotion vehicle for businesses and to embrace reviews as something that should be asked for, encouraged, and balanced by true authenticity not by software that filters out reviews from new users with a short engagement history. Why Do You Use Yelp? Inquiring minds want to know. Leave a comment below and share your thoughts.